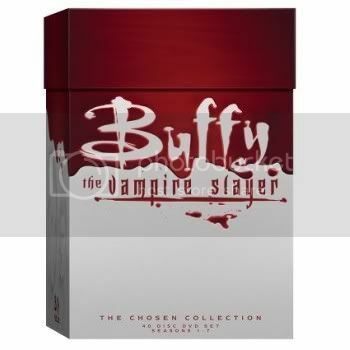 Geek Steal: 65% off Buffy The Vampire Slayer - Collector's Set! Sorry, for the late notice on this, my dear monkeys, but this is a deal worth jumping on if you get the news in time. And really, why wouldn’t you get it in time? Since, you know… you spend several hours a day obsessively clicking the refresh button on this here blog like a lab rat on speed frantically pressing a lever that just might eventually give you a bite of cheese. For today only, Amazon is selling the Buffy The Vampire Slayer – Collector’s Set for $69.99, 65% off the list price of $199.99. That’s all seven seasons on 40 DVDs, plus interviews and bonus footage, for $117 off yesterday’s price of $186.99. If you’re not already on the Buffy fanwagon, now would be a great time to get on board. Otherwise, I might have to consider revoking your blog-viewing privileges. Let’s not let it get to that point, shall we? Buy the Buffy The Vampire Slayer – Collector’s Set. Can’t get it to work, whether through this link or Amazon directly… still shows regular price. Will it correct itself upon checkout?